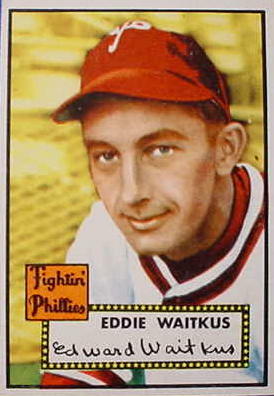 In 1946, Major League ballplayer Eddie Waitkus was lured to a hotel room and shot by a deranged fan. He recovered rather miraculously, and resumed playing within a few months. Still, the long-term physical and emotional consequences of the attack interfered with his progress as a ballplayer and impacted his personal life. The incident also had literary consequences, inspiring the shooting scene in Bernard Malamud’s novel The Natural. Waitkus died relatively young, while his assailant, Ruth Ann Steinhagen, died just recently, having lived in obscurity for many years after a brief stint in a mental hospital. Apparently Waitkus declined to press criminal charges against her. Steinhagen had become obsessed with Waitkus when he played for her favorite team, the Chicago Cubs. The obsession apparently tipped into something more lethal when he was traded to another team. She must have felt that he “deserted” her. The story makes me cringe a little. I’ve been a sports fan from a young age, and have developed occasional crushes on baseball and football players. I know I’m not unusual in that respect. In fact, local sports machines and related industries thrive on hero worship. I’ve never built a shrine to a particular player in my home, as Steinhagen reportedly did, but I’ve certainly collected clippings. I’m generally too shy to pursue autographs or to try to meet my heroes, probably for fear of finding out they’re jerks. (I witnessed this once, many years ago, when a girlfriend of mine was snubbed outside RFK Stadium). And yes, I’ll even admit to feeling somewhat “deserted” when certain players get traded away, especially if they badmouth my teams when they depart. Obviously, most fans don’t go to Steinhagen-like lengths to impress their heroes. Even when an innocent crush becomes an obsession, it rarely tips into insanity. Yet there have been enough incidents of obsessed behavior to convince sports leagues to beef up security and limit fan access at ballparks. Probably every popular player in every sport has encountered a fan or two who skirts uncomfortably close to the edge. How can a fan ensure that this hero worship remains sane? I have an outlet for it, since I’m a writer. I get “revenge” for my unrequited love by using select players in stories. Certain readers who are familiar with my local teams have been able to identify the battling quarterbacks in Secretarial Wars, the burly, curly-haired running back in The Rock Star’s Homecoming, and the proud “rednecks” who clash with immigrant teammates in Let’s Play Ball. Nowadays many fans vent their emotions in numerous chat rooms where they can praise or bash athletes anonymously. Outlets like these presumably help to keep us from flipping out. Still, the Waitkus-Steinhagen tragedy reminds us that hero worship isn’t always fun or innocent.